- Helps to moisturize my dry skin. - Delicious scent! Smells like herbs and lemon. - Can only be used at night since it's a bit too thick for day use considering Malaysia weather. 1. Follow this blog The Thinker Belle. 2. Subscribe to my channel and like my video. 4. Leave a comment on my Youtube or my post here on why you want to try the product and your email address! I decided to open this giveaway WORLDWIDE so do join~! * Contain horse oil ingredient. Further reading advised on product usage for Muslim as I was not aware of the status by the time I made this video. I've stopped using it since it contains the controversial ingredient but my opinion about this product is still the same nonetheless. nice giveaway, haven't try this yet. But once you mention something I like I really want to try my luck. All the best girls for trying out the giveaway. And congrats on your first video. Expect to see more right. Cute design on the packagin. 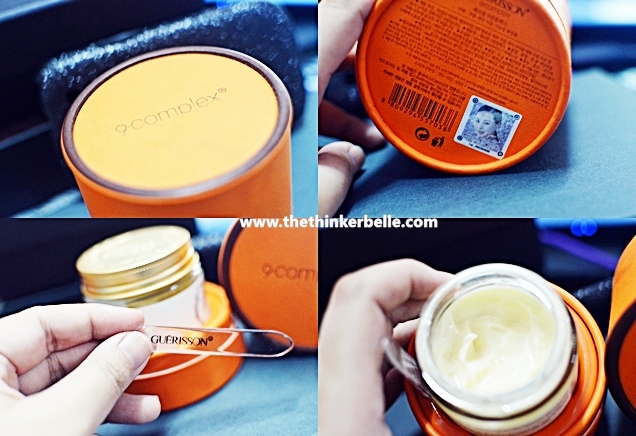 I heard a lot about the Guerrison 9-Complex Cream but I have not try it yet. The results looks good on you. Great product! Nice review and cool giveaway! OMG OMG.. I WANT THIS. I want this because a friend introduced this to me and ever since then I been eye-ing on one. Need this prevent wrinkles and fade scars on my face. I even heard it can help with hair lost? haha. I need it la to avoid looking like an old woman. Anyways hope I get it. hahaha :D Subscribed to you already! I have heard about the Guerrison cream before; and the results do look great dear :) Nice giveaway by the way and thumbs up! Hi there! You did well on your first video! I hope to win this to hydrate my skin without making it oily! I hope I can win this! May I know who won ur giveaway dear..
Hi Surya, I will select the winner soon. So sorry been busy!